‘Tis the Season to Stay Fit! 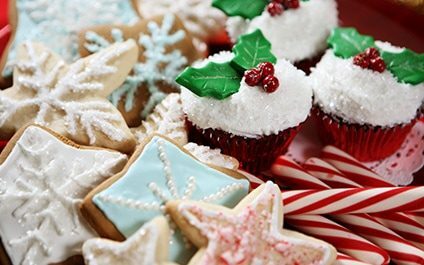 Don’t let holiday eating damage your health and waistline – you CAN stay fit while celebrating! Here are some tips to keep in mind over the holidays and all year long. Do NOT show up to holiday parties on an empty stomach. Plan ahead and have several small, protein-rich meals and snacks, such as small servings of yogurt, almonds, or fruit with peanut butter, during the day. This will help you maintain your blood sugar level through the day so you are not craving every sweet at the party. Don’t skip a meal to “save” your calories for party food. This plan makes people think they can eat everything in sight at the party. JUST SAY NO to liquid calories – some punches and creamy drinks have more calories than food. Also, when indulging in beer and wine, drink twice as much water – it will help negate the dehydration caused by alcohol and will fill you up as well. Add some heat! Spicy foods such as red pepper flakes and hot sauce help boost your metabolism. Schedule your exercise on the calendar just like you do for holiday events. You are more likely to stick with your workout plan if you set aside time for it in advance. If you feel you don’t have much time to exercise, consider doing shorter bursts of higher intensity circuit exercises rather than long runs. Even if you cannot get to the gym, remember that these exercises can be done anywhere: walking, jumping jacks, squats, push-ups, sit-ups, lunges, and planks. Don’t forget to pack your exercise bands when traveling. Incorporate extra movement in your daily life. Park far away from the mall and grocery store, take the stairs instead of elevators, and walk instead of driving around neighborhoods to look at holiday lights. Extra steps means extra calories burned. Use a tracking device to see how many steps you can accumulate. Join a group exercise class (like our Pilates classes!) with friends to keep you accountable for your activities during the holidays. Challenge your friends with fitness tracking devices to meet or exceed your daily step goals. If you participate in holiday gift exchanges, ask for small weights, exercise clothes, a workout DVD, or a gift certificate to a gym or yoga class. You should consult with your physician when beginning an exercise plan or diet. Feel free to contact us today to make an appointment with one of our healthcare providers to help you stay on a healthy track or lose weight during the holiday season!